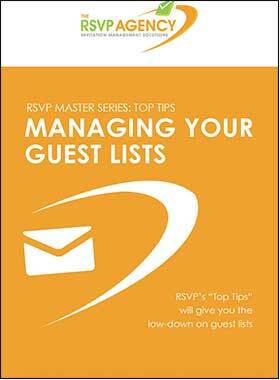 Download "Top Tips on Managing Your Guest List"
Terry Sutherland is the founder of the RSVP Agency and has extensive experience in the development of RSVP solutions for clients across industries. Rene Fletcher has worked across a number of sectors and managed many large scale RSVP projects. Rene has deep insights into the challenges that Event Organisers face running a professional RSVP Project from concept to conclusion. The RSVP Agency offers a professional service with an outstanding track record in the management of RSVP projects. We have developed the most user friendly and cost effective Invitation and RSVP Management Solution in the industry today, making our services and software the perfect match for any company or individual that requires a full RSVP service.Terry Sutherland is the founder of the RSVP Agency and has extensive experience in the development of RSVP solutions for clients across industries. Rene Fletcher has worked across a number of sectors and managed many large scale RSVP projects. Rene has deep insights into the challenges that Event Organisers face running a professional RSVP Project from concept to conclusion.